This story is a first hand account from Dr John Sleggs who is a member of CBC and used to work in Nepal. Retelling the story was inspired by the latest teaching series at CBC on Elijah & Jesus. The spring and summer of 1975 was a prolonged drought in England. There was practically no rain from May right through August, and the fields were bone dry. At that time I had been meditating on the story of Elijah, and felt the churches should somehow take a lead in praying for rain. In the end the Sikh’s had a well publicised rain making ceremony in London in early September, and few days later it began to rain. This was grievous for the honour of God’s name. In 1979 I was in my second year at Tansen Mission Hospital. There was a prolonged drought from January through to mid May. It was getting too late to plant the maize, on which many people depended for their food. I found myself praying for some opportunity for God to demonstrate that He alone controlled the weather. The Hindus in my village had a rain making ceremony and sacrificed some expensive breeding goats, but there was only a little drizzle. Once or twice I had been invited to a desperately poor village called Gorbandha, half an hour’s walk down the hill from the village where I lived. The people in that village were desperately poor. They walked half an hour in one direction to get water. They walked half an hour in another direction to get the special clay for making clay pots. Wood for firing their clay pots was half an hour in a different direction. Then it was an hour’s walk to Tansen bazaar to sell their pots. They depended on growing maize on a very dry hillside to survive. It was already late to plant the maize. There hadn’t been rain for several months. I was asked to speak at the Nepali Church at Tansen. The Nepali Christians are always putting on a brave face, so I decided to speak on Elijah and his depression – causes and cure. This meant I had to cover the prolonged stress of hiding from Ahab and living in unusual circumstances – by the stream and then with the widow, right beside the town Queen Jezebel came from. Then the highly stressful events of Mt Carmel, executing the priests of Baal, and then a long distance run. No wonder he was emotionally and spiritually vulnerable when Jezebel threatened to kill him. A couple of days later I was asked to visit my Christian friends in Gorbandha. My friend there gathered together his family and one or two Christian friends, and we sang a few Nepali hymns. Without any prior discussion with me, he then announced that ‘We are very pleased to have our brother, Dr John, from the mission hospital to give us the sermon’. In the few moments I had to decide what to talk about, the only possible thing I could think about that I had the vocabulary and the thoughts prepared, was to talk about Elijah’s encounter with the priests of Baal. We all prayed for God to send rain so these people could plant their maize. I walked back to my village near the hospital, and thought, “How did I get into this situation?” “What am I going to say to these people when nothing happens?” “How utterly foolish to have bumbled into this situation.” I noticed it was just a little bit windier on the way home. I was woken a couple of hours later by rain lashing down on the tin roof above my head. ‘There was a massive thunder storm and my friends in Gorbhanda had to pray that it would go away before any houses got struck by lightning. 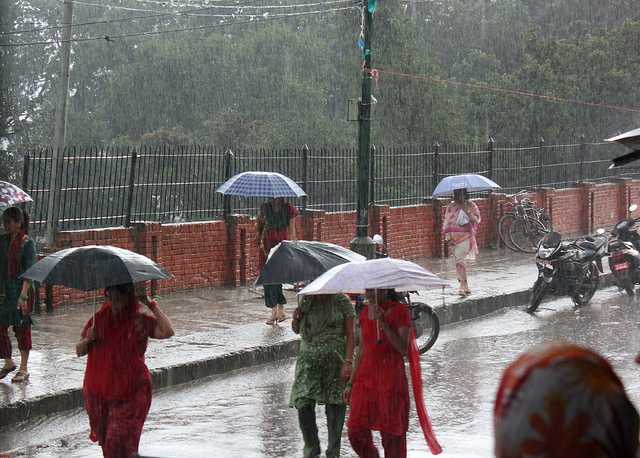 My village and Gorbandha were soaked, but Tansen bazaar a couple of miles away got nothing. Sadly we failed to capitalise on this demonstration of God’s answering prayer for rain. I think I suffered an emotional reaction and felt very flat spiritually for the next week or so. However, several of my friend’s brothers decided to follow the Lord, and all his six children are also following the Lord, and there is now a church in that village.